The ITDG / UK Food Group seminar "Genetic Futures in Food and Farming" was held in preparation for the Convention on Biological Diversity's sixth Conference of the Parties (CBD/COP 6). The main conclusions of the seminar were that the CBD - as the UN watchdog on these issues - should reinforce the importance of diversity, take a tough line on the spread of GM crops, patenting, GURTs and pollution, and reassert the Precautionary Principle with respect to the development and use of genetic engineering technologies. Ensuring corporate accountability and liability for biosafety. "The role of genebanks in the conservation and use of genetic resources"
"Identifying opportunities for advancing the CBD agenda"
A summary of the main concluding points of the meeting has been prepared - for presentation at CBD/COP 6 meetings. The UK Food Group Sustainable Agriculture Working Group / UKabc is planning this pre COP 6 seminar as one of a series over the next three years. 2002 promises to be a very active year with a number of processes on food, environment and trade being debated in many national, regional and international fora. Issues on sustainable agriculture, genetic resources and agricultural biodiversity will be hotly contested in several of these fora - not least the Convention on Biological Diversity and the Food and Agriculture Organisation, as well as the World Summit on Sustainable Development (Rio+10). And at the sharp end, local food security, rural livelihoods, seed saving, local breed maintenance, sustaining agricultural biodiversity and the integrity of agroecosystems are increasingly vital issues for poverty reduction strategies. This UK Food Group working group has the opportunity to bring together a wide range of thoughts and experiences on these issues and provide a platform for the UK NGO lobby to government and internationally. 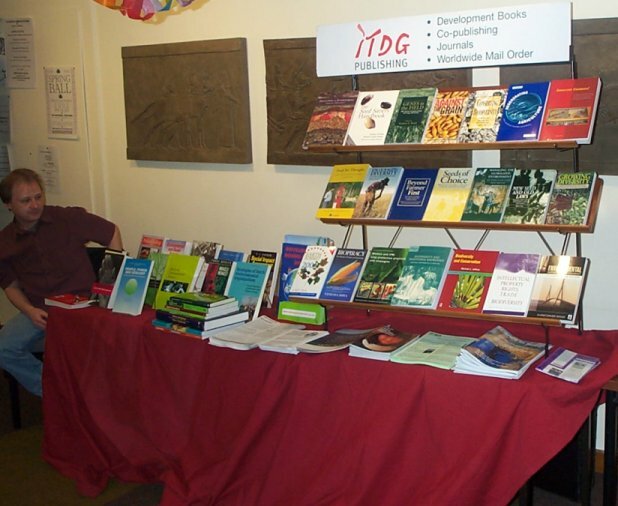 A number of ideas for activities are planned, including the organisation of this and one other seminar in 2002, the second before the FAO World Food Summit: five years later in May. Tony Gross focussed on the process of civil society involvement in the CBD and bringing farmers' issues into the policy process. The CBD is an intergovernmental legal instrument, with a set of institutions attached to it, which sets a framework for national activities. It is a political instrument to deal with the whole range of issues on biological resources, and not a mechanism for implementation, which is carried out through other bodies and at national level. The COP is a forum for political negotiations around scientifically based recommendations. Countries come to the meeting well prepared with set positions which have been worked on during intersessional processes at national level, so the opportunities to influence the outcome of the COP itself are limited. The COP is thus like the tip of an iceberg: the national level negotiations preceding the COP predetermine the visible negotiations. Lobbying can influence the text, but only to a limited extent. COPVI will be a series of set piece discussions on text: there are 244 pages tabled, including 15 pages on Agricultural Biodiversity. Influencing the policy setting agenda on agricultural biodiversity of the CBD requires consistent effort and involvement. A conscious decision has to be taken, to get immersed in the issues, and negotiate over details of the text. The traditional negotiating blocks of developed vs developing countries, east vs west Europe, are fracturing and new alliances are forming, which makes the whole negotiating process very complex. NGOs will have more impact working at the national level, where policy is developed, and joining forces in multilateral alliances. There are opportunities for NGOs and civil society stakeholders to submit views and case studies to committees of the CBD - e.g. inter-sessional bodies on GURTs - to redress perceived imbalances in CBD positions. When rosters of experts are established, NGOs can put people forward to serve. Involvement requires an understanding of the timetabling and process, and knowledge of the personnel in the Secretariat. The key issue for Via Campesian is food sovereignty - the right of farmers to build and sustain local food systems based upon locally available resources. Via Campesina is therefore against trade liberalisation in agriculture: low price food dumping causes destitution amongst small farmers. Via Campesina demands market regulation - the right to apply import controls, opposition to export subsidies and the right for state support to sustainable farming. 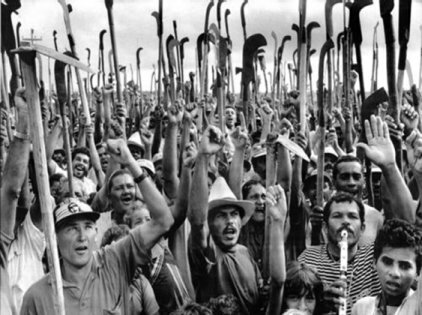 April 17th is designated International Day of Farmers' Struggle. A major effort is currently underway to build alliances for an outright ban on GMOs - to get genetic engineering out of food production. A Ban on GURTs is to be proclaimed. The danger of contamination of Gene banks and of centres of biodiversity will be highlighted. Via Campesina is concerned that benefit sharing from, and access to, genetic resources will become a back door entry for patenting. To avoid this, there must be concrete steps towards a ban on the privatisation of genetic resources. ActionAid recently ran a high profile campaign in the UK on patenting of food. Action Aid sought to show the potential outcomes of patents on common foodstuffs through a tongue-in-cheek proposed patent on the ready-salted potato chip. This is a highly political issue and ActionAid seeks to highlight the absurdity and injustice of new patent rules that allow companies to get exclusive rights over basic foods and even nature itself, simply by adding something to it or modifying it in a way that has not been done before. 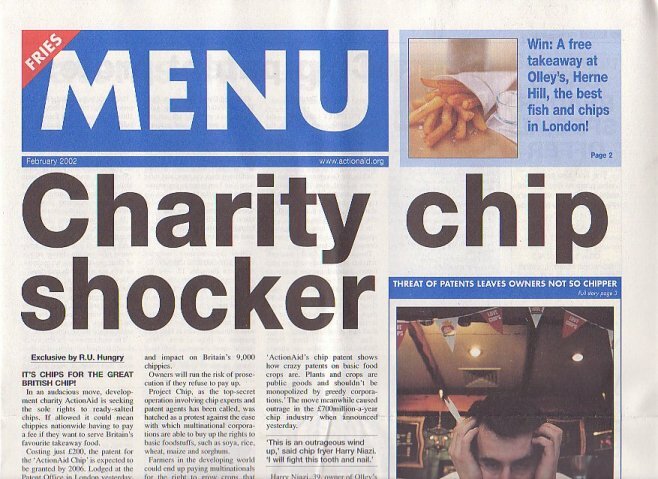 If successful, the patent could give ActionAid legal rights not only over the ActionAid Chip, but also over any chips that have salt added to them. An application was formally made to the UK Patent Office. However, they have learned that the Patent Office is running a smear campaign on the application, so that it will not be taken seriously. A campaign run by ActionAid, sent out to 20,000 UK households inviting them to send back a postcard to their MP, elicited a return of 7,000 - a huge response for this type of activity, indicating the strength of public feeling on the issue of food patenting. GEN - a network of over 100 people -- working to raise public awareness about genetic engineering. As a result of this work, the European public has quite a sophisticated understanding of the issues of genetic modification to food, and strong opposition to it. Linked to this is a growing adverse reaction to the perceived corporate control on food production and supply. 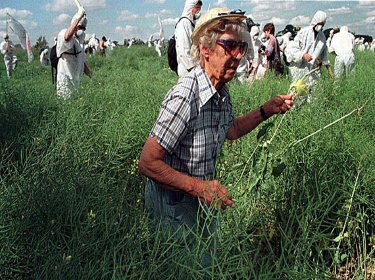 The impact of GEN and other groups' work is seen in the protests at every GM crop trial in the UK, from peaceful marches and banner holding, to the uprooting of crops. Internationally, activism is not limited to middle classes; in India poor farmers groups have been mobilised on the GM issue, and have lobbied their government hard. 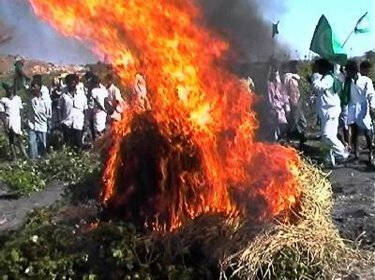 Burning of Bt cotton trials illustrates the strength of feeling on an issue which farmers believe threatens their livelihoods. GEN is joining a programme of activities in the Hague at COP VI, entitled 'Resistance is fertile', a banner for a large and diverse European group of civil society organisations. 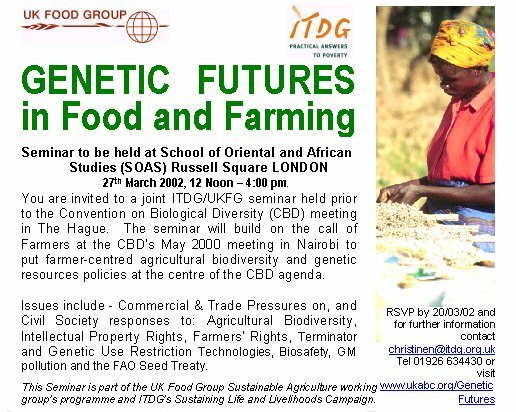 The event will call for radical change in agriculture and international trade, for reclaiming our genetic resources (free the seed! ), against GMOs and patents on life and against the corporate control of food and agriculture. 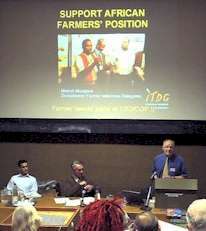 Actions will focus around the International Day of Farmers' Struggles, April 17th. Evidence of extensive Civil Society Mobilisation on the issues around agricultural biodiversity is the proposal for a Treaty of Global Commons announced at the World Social Forum in Porto Alegre their support for a treaty which would establish the earth's gene pool as a global commons. The treaty is the first globally coordinated campaign among biotech activists, and already has the support of over 250 organisations. Non-Governmental Organizations (NGO) leaders have said they will challenge government and corporate claims on patents on life in every country. Activists will be working with political parties to introduce the Treaty Initiative in parliaments around the world over the next year. In September 2002, activists will demand that governmental delegates to the Rio +10 Conference in South Africa endorse the Treaty to Share the Genetic Commons and make it the centerpiece of future biodivers ity efforts.